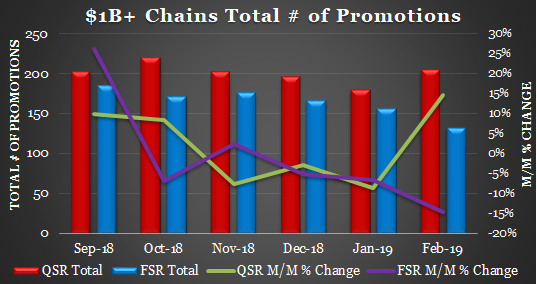 Final 4Q:18 comps came-in generally as expected with FSR continuing to outperform QSR as the casual segment improves their value equation. All-the-same, absolute results remain muted as lower income consumers continue to struggle with cost of living inflation that exceeds income growth. 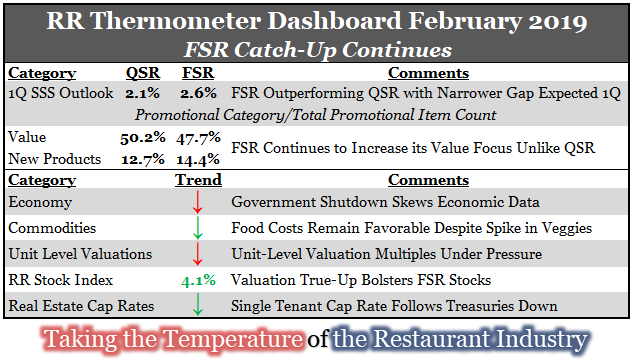 1Q:19 street outlook suggests similar overall comp performance, but a narrowing gap between QSR and FSR. 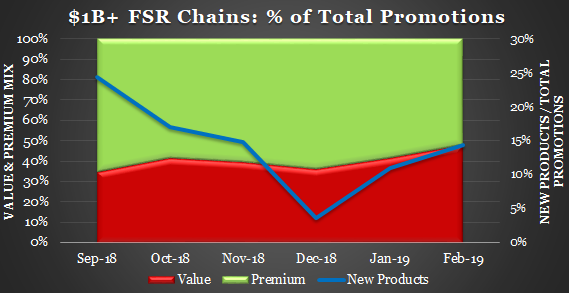 QSR price point value mix continues to decline and February's 50.2% mix represents the lowest level since July despite a sharp increase in other value including free or discounted delivery offers (especially on Superbowl Sunday by sandwich players). 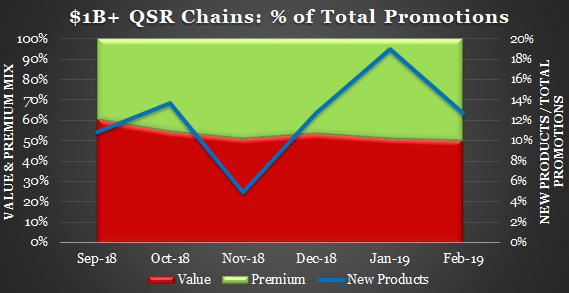 QSR seeks to compensate for a lower value mix with a sharp increase in overall promotional activity. ​Conversely, FSR value mix continues to ramp-up with a +640 bps m/m increase to 47.7% in February (the highest mix since 53.7% in 1/17). Innovation also picked-up in casual (led by Olive Garden & Red Lobster) and fast casual (Corner Bakery). 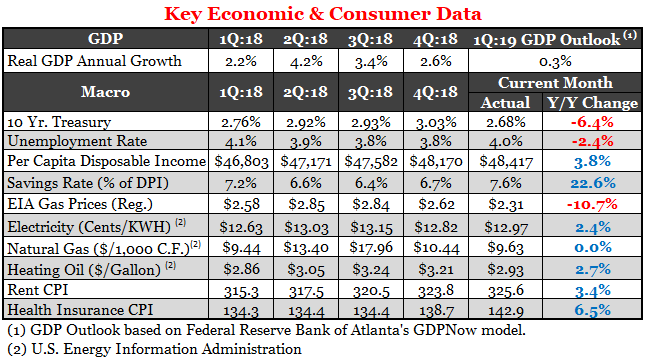 GDP growth uncertainties contrast with a strong +8% m/m increase in February consumer confidence and a rebounding stock market. Pros: lower tax rates (after a slow start, tax refunds are ticking-up); falling gas prices; and m/m decline in interest rates (FED becoming more accommodating). Cons: Slowing disposable income (+3.8% in January vs. +5.3% in December) and up-tick in unemployment rate reflects impact of government shut-down. 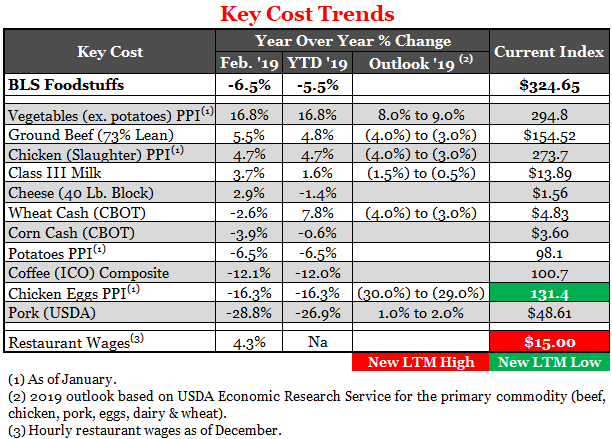 The BLS Foodstuffs Index declined for the 5th consecutive month on a y/y basis and the 2019 USDA outlook remains favorable with eggs (new LTM low), chicken, beef and milk revised lower for the month. Fresh vegetable prices remain elevated due to a colder than average winter. 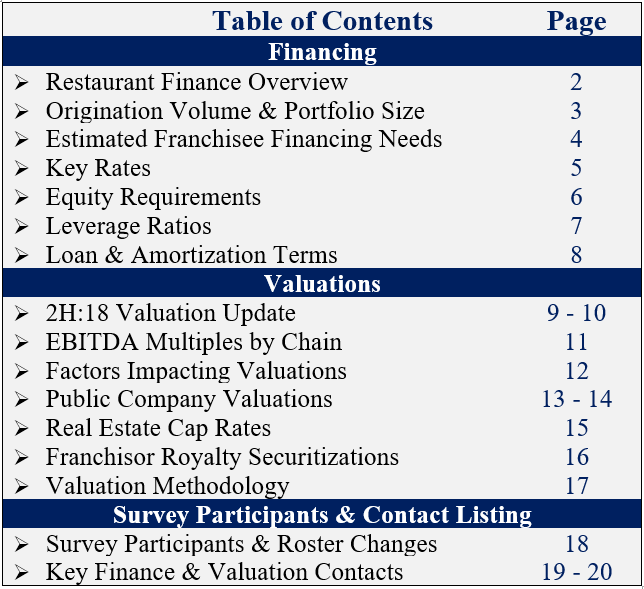 Slight acceleration in downward pressure on franchisee valuation multiples may reflect increasing equity requirements as a result of a rise in technical defaults in lender portfolios as tepid sales growth and rising labor costs pressure unit level margins. Downward pressure on multiples are most notable with: smaller brands; brands with stringent transfer requirements; and under-performing brands. 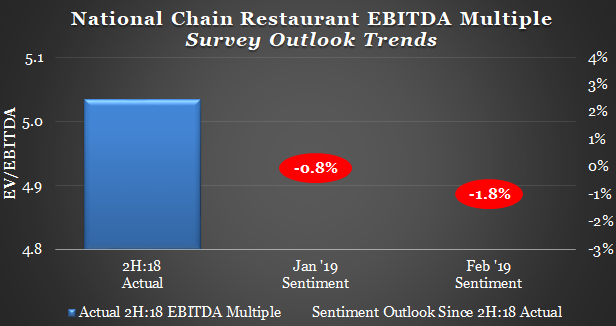 Arby's & Popeyes multiples continue to trend higher, while Taco Bell (although still among the highest in the space) and Buffalo Wild Wings (due to weak sales results) are trending lower. 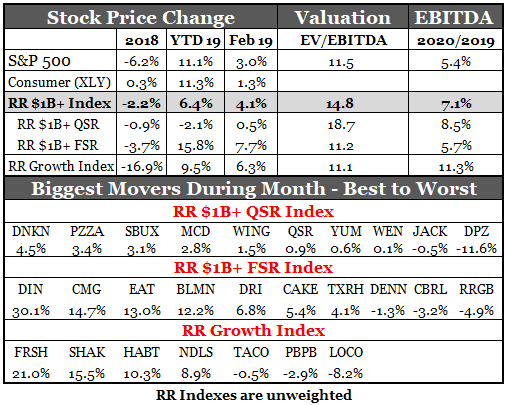 RR $1B+ Index outperformed in February, propelled by FSR. While QSR's forecasted EBITDA growth significantly exceeds FSR, FSR valuations have a long way to go to catch QSR. 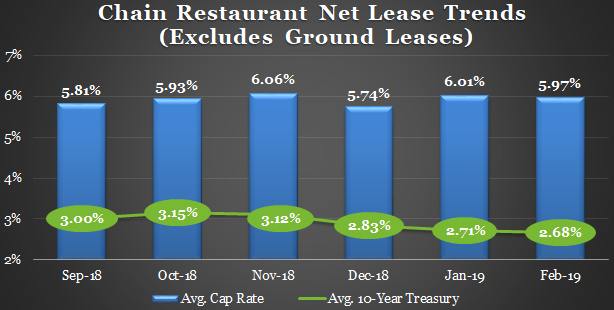 This suggests that current restaurant stock action is mostly about a valuation true-up (FSR vs. QSR) as FSR sales data provides investors with more confidence to put money to work in this beaten-up sector. Cap rates declined by 4 bps in February, consistent with the 10-year treasury decline of 3 bps.